Recently the lovely team over at Monu Skincare got in touch with me over Twitter after I asked them for some advice regarding the problems I have with my skin, they came back to me with some recommendations and kindly sent over some products for me to try! Monu is a brand that I don't often hear much about but they pop up on my Twitter a lot so I've always been intrigued. They are a brand that has been focusing on using natural and gentle ingredients for a couple of decades now, they don't test on animals and you won't find damaging chemicals, artificial perfumes or synthetic colours in their products. I've been trying over the past year to become more aware of what I'm putting on my face so I'm always happy to try out brands and products that are made up of natural ingredients. The first product that I've been trying out is the Moisture Rich Delicate Facial Wash, a product recommended for those with dry and/or sensitive skin. On FeelUnique it costs £16.50 usually but right now you can find it on sale for just £13.20 so it's a great time to give this brand a go! This is said to be a rich, aromatic face wash that will leave your skin feeling cleansed and hydrated and I can definitely agree with that. It contains things like beragmot and lemon, grapefruit and orange essentials oil which give it a refreshing and natural scent, perfect to wake you up a little in the morning. It also contains vitamin enriched yoghurt extracts to soothe and calm your skin, hence why it is perfect for those with dry or sensitive skin. I found this to be both refreshing and hydrating, it's a light product that leaves my skin feeling soft and yet thoroughly cleansed as well. I'll definitely be adding this into my regular skincare routine from now on! The Soothing Touch Recovery Balm is another product from them that is recommend for sensitive and also stressed skin. It's said to be a gentle balm that provides effective relief to all skin types. Again this is avaiable on the Monu website to buy but it's ever so slightly cheap at it's usual price of £22.50 on FeelUnique but like the product above it's currently on sale at £18 right now. This moisturising balm contains evening primrose and blackcurrant seed oils with essential fatty acids to help repair skin lipids as well as being packed full of shea butter to leave your skin feeling soft and hydrated. It also strives to help protect your skin so it could be a really good option for someone suffering with particularly sensitive skin. Personally I found it to be a little too heavy for my liking with the weather right now, it did definitely leave my skin feeling moisturised and hydrated but I often just prefer something a little lighter like a serum. This is all down to personal choice though and I'm sure once Autumn and Winter come around again I'll be more than happy to have a balm like this ready to keep my skin soft and protected from the cold and wind. 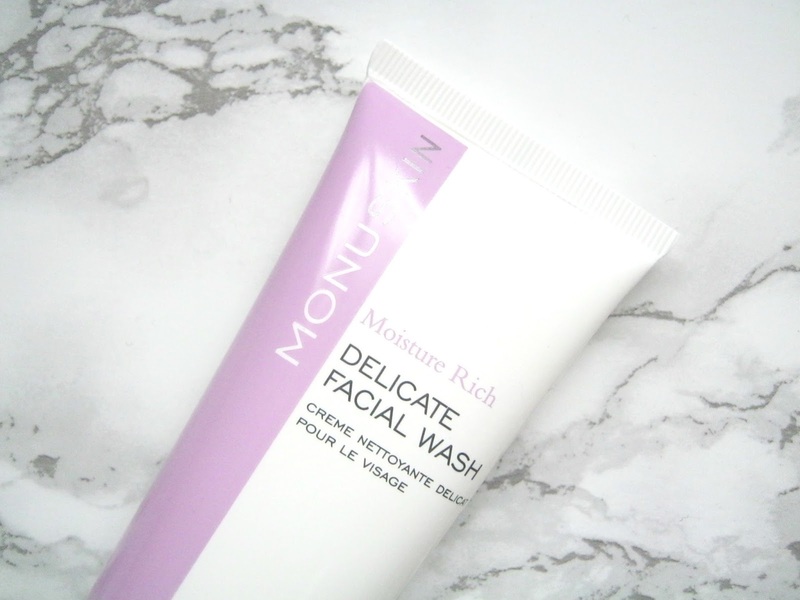 I was definitely surprised by how much I enjoyed using these products since I haven't heard too much from others about Monu before but in the future I'll be turning to them more when my skincare routine needs shaking up! Have you tried anything from Monu before? Or is there another brand that is new to you that you are enjoying? Let me know below! The above products were sent to me for review consideration but this does not influence my opinion and I am always 100% honest. I haven't heard of this brand before but it sounds really good! I remember trying a serum by them not so long ago and really liking it. I see them pop up in beauty subscription boxes from time to time and most of what's said is really positive!